This week is a trading range week. Price made a low on Monday and a high on Tuesday. Price is still contained within this range. I drew a trading range on the chart. The support would have given you more places to look for entries than the resistance area. Most likely is, that price will keep trading sideways. Though it just made a strong bull leg from the bottom of the range. That makes a test of the resistance area(12.920) probable on the short term. There is plenty of movement in the swings within the range to make some good profits. And often price does reach the 10 pip scalp target. On the 15 min chart this is a 100% expansion area(more clear on the first chart posted). It is also a double top after a three push pattern up. After a three push pattern price often makes some kind of correction. Here I like to manage any longs, and in a range market I also like to risk this setup for a short scalp. Also it is likely, that the green support area below will get a re-test. 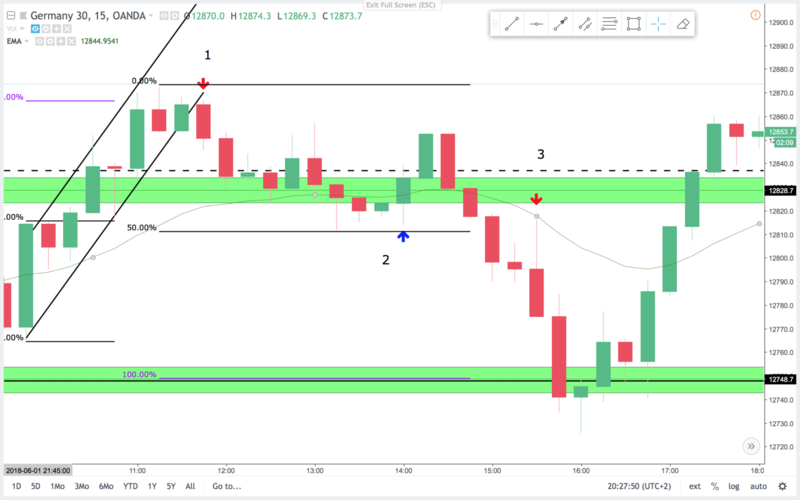 On the 5 min chart this trade is not easy. It is a lower high after a double top. It is just into a trendline after a three push pattern up. This trade is a bit risky. But i liked it for a potential reversal. Given the week as been a range week, the pullbacks often get deeper, and this could easily get enough for a scalp. Also the DAX has a tendency to reverse and begin trending opposite directions at around noun. Here I only had to risk it to above the prior high. 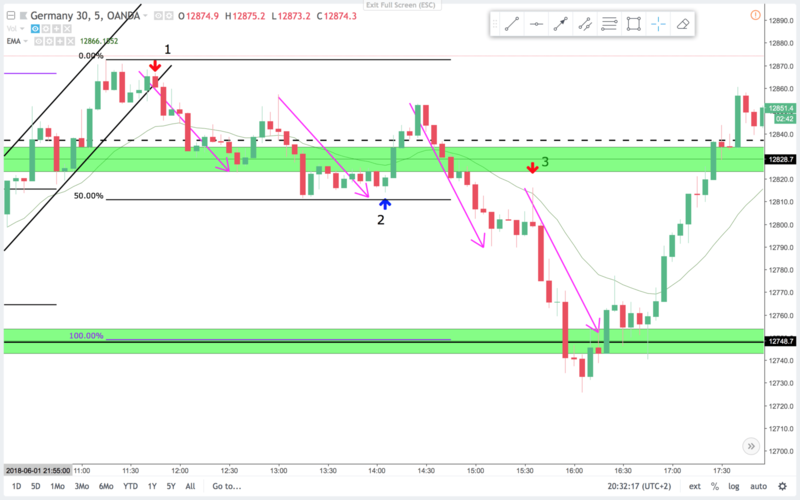 On the 15 min chart this is a double bottom and a second entry long(if you entered when price broke above the bar before the blue arrow). Price traded lower first then higher. That is a good buy signal and an example of prior resistance now serving as support. The BO only reverses down after the 10 pip scalp was reached. The two bar reversal sell signal that followed 30 min after the bull signal was a nice signal to sell the DAX short. Even though it was into support… It was a failed second entry long bull trap. 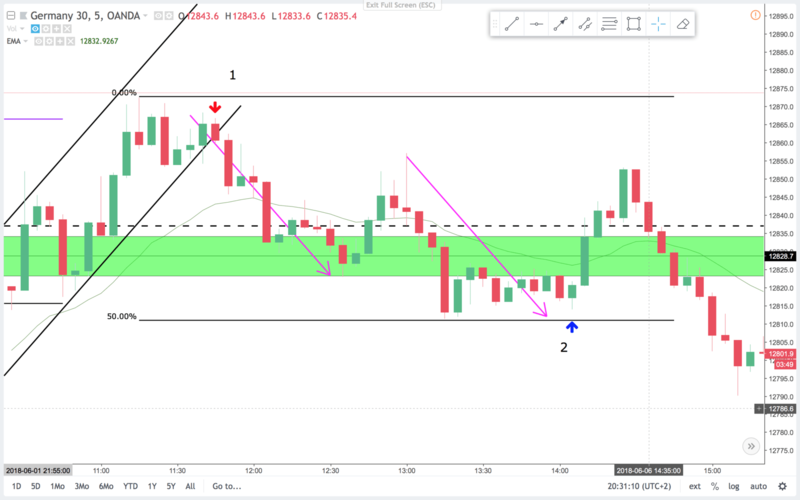 On the 5 min chart price just completed a measured two leg correction(purple arrows). Price made a triple bottom with higher lows(final flag wedge bottom). I like that for a potential continuation on the morning bull trend. The signal bar is small and the stop goes below the last swing low. The trades gets going from the start and is an easy scalp. On the 15 min chart this is a breakout pullback first entry short. Price traded up to test the support it had just broken below, then sold lower. I like to add on or enter short when it broke below the small bear doji preceding the signal bar. Target a measured move down. Or a move to support below. Price ended up overshooting the 100% expansion of the upper trading range. This was a nice trade. On the 5 min chart it is clear that bears are in control. Small or no bull bars and a lot of bear bars closing at or near the lows- after the second entry long failed on trade 2. Trade 3 is a nice second entry sell signal. Really good bear signal bar and a breakout pullback sell signal. High probability on this trade. Price rushed to the support magnet below and bounced. Also it overshoot the measured move on the exhaustion towards the support. This was the major support area of the larger trading range. So in that perspective a great place to take profits on any shorts. If profits was taken at the 100% expansion or the measured move target, or the support area, then you got out near the low of the day. In a larger trading range like the one on the 15 min chart you can wait a long time for it to reach the high or low. Still it is possible to make money of some great setups in the middle. 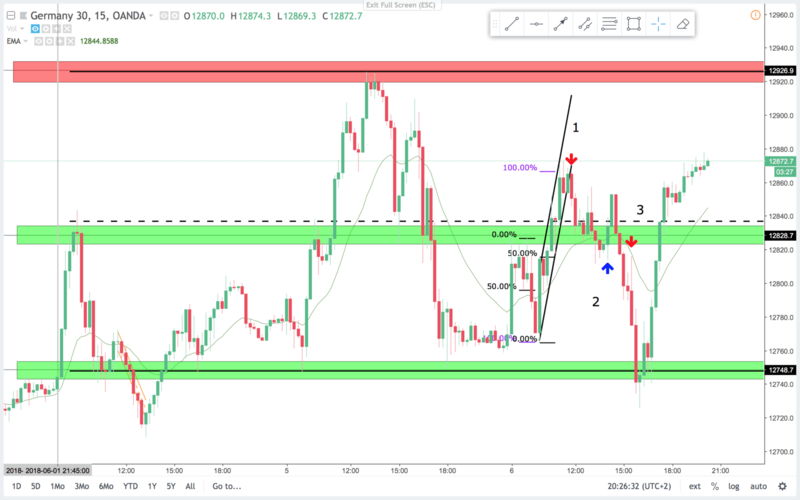 Just be carefull, often price retrace back to entry areas and take out break even stops, and also price often reverses. But that said, the DAX often reach the 10 pip scalp target in a range like this.